The Board of Investment of Sri Lanka (BOI) granted investment approval to Phytosynthese Lanka (Pvt) Ltd, to set up a project related to medicinal plant cultivation. 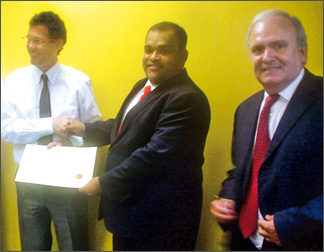 Chairman/Director General Dhammika Perera signed the agreement on behalf of the BOI and presented the BOI certificate of registration to Phytosynthese, France Managing Director Thierry Picaud. Commercial Counsellor of France Bruno Viviezi represented the French Embassy at the signing. Phytosynthese Lanka signed the agreement to set up a project to cultivate medicinal plants and extract plant based medicinal compounds for export. Phytosynthese Lanka will be engaged in the cultivation of turmeric in the Eastern Province. The compound extracted from turmeric is high in medicinal value and is used as an ingredient to manufacture the animal care products. An initial investment of Rs. 25 million on the company provides employment for 40 at initial stages. The venture will initially commence operations with the outgrow farmer model with the assistance of local authorities, providing aid to farmers of the area to cultivate turmeric. The company also expects to set up a state-of-the-art extraction plant to extract the medicinal compound from the turmeric. Picaud said “Sri Lanka inherits a history of traditional medicine and the venture will help expand trade relations between France and Sri Lanka”. He said the company will later invest in the development of irrigation systems and high technology extraction plants. “Phytosynthese, France is a leading manufacturer of natural medical products for animal health care. The products manufactured by the company are exported to 45 countries including markets in Europe, US, Canada, Japan and Brazil” said. Phytosynthese Managing Director Thierry Picaud and Director Pasan Mendis signed the agreement on behalf of the company.